Rent villas and apartments in Taranto Province, Italy with private pools. Book affordable holiday rentals that are near a beach and golf course. This 3 bedroom villa is located in Castellaneta Marina and sleeps 9 people. It has air conditioning and barbeque facilities. The villa is near a beach. This 2 bedroom villa is located in Martina Franca and sleeps 4 people. It has air conditioning, a garden and barbeque facilities. This 1 bedroom apartment is located in Campomarino and sleeps 4 people. It has air conditioning, parking nearby and a gym. The apartment is within walking distance of a beach. Enjoy your holiday in this charming cottage in the countryside of the beautiful region of Puglia, located about 6km from the town of Grottaglie, known for its pottery and wine production. Holiday apartment located within a tourist village equipped with outdoor pool (free access), spa with indoor heated pool, sauna. This 4 bedroom villa is located in Martina Franca and sleeps 7 people. The villa is near a beach. Tenuta I Pagliari is a stunning, luminescent, architecturally prestigious home, just south of Taranto, close to some of Puglia's most beautiful beaches and azure waters. This 1 bedroom apartment is located in Manduria and sleeps 3 people. It has air conditioning, parking nearby and a gym. The apartment is near a beach. This 2 bedroom villa is located in Martina Franca and sleeps 4 people. The villa is near a beach. 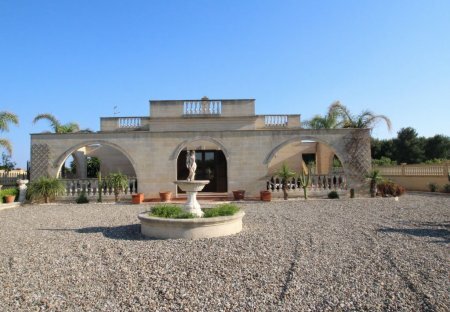 In the traditional conical style of the Puglia region, Tenuta Montanaro has the feel of a real family home. A few chilled bottles of white wine await you on arrival. This 2 bedroom villa is located in Martina Franca and sleeps 3 people. The villa is near a beach. Located a short drive outside of Martina Franca, in the Puglia region of Italy, Villa Battaglini offers the quality and design reflecting an authentic Italian get-away house. Set within its private. Trullo Adriana holds a magnificent location in the picturesque Puglian countryside, surrounded by olive groves it offers both peace and tranquility. The World Heritage site. Privacy, comfort, fun and sheer hedonism. Gorgeous swimming pool and five acres of mediterranean landscape to enjoy with family and friends. This 5 bedroom villa is located in Martina Franca and sleeps 10 people. It has air conditioning. This 3 bedroom villa is located in Martina Franca and sleeps 6 people. Trulli Carmina is something of a rarity to find such elegance in a typical countryside retreat.